Good nutrition is always important throughout life, but did you know that nutrition is the most influential non-genetic factor of brain development?1 Whether you are planning to conceive, expecting, or breastfeeding, medical and nutritional experts agree that nutrition becomes even more crucial during these times, as it has implications for both you, and your baby. During pregnancy you need to be even more conscientious of the amount of essential fatty acids (EFAs) in your diet. Your body will begin to prioritise your baby’s brain development and therefore shunt fatty acids from you and deliver them to your baby.2 EFAs are vital for good health, so it’s important to make sure you are always getting enough. The best source of Omega-3 EFAs is fish, therefore you should consume enough fish to receive the benefits that EFAs offer your body. 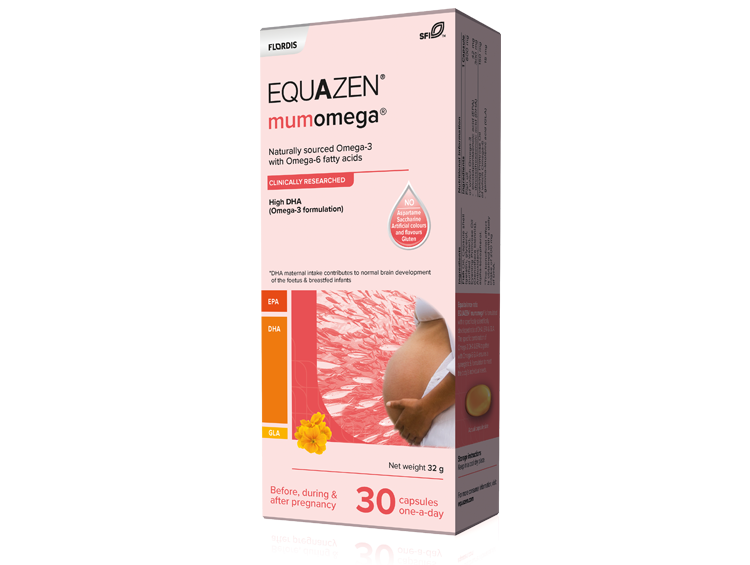 Mumomega provides additional supplementation of essential fatty acids to help benefit both you and your baby. DHA: Docosahexaenoic Acid; EPA: Eicosapentaenoic Acid; GLA: Gamma-Linolenic Acid. Food for thought: Adding Mumomega early may support your babies’ essential fatty acids need and help support early brain development. Mumomega contains only high-quality ingredients. Our oil comes from sustainable fish sources such as sardines and anchovies from the Southern Pacific and Morocco sea. These fish are known to have a naturally high level of DHA. One capsule of Mumomega daily throughout pregnancy and breastfeeding ensures recommended doses of DHA. Dose: One capsule daily taken with food.